OBGYN director stuns leftist MKs by revealing Arabs request separate maternity wards, haredi and secular women also separate on Shabbat. 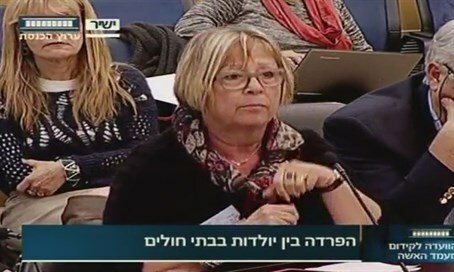 Prof. Drorit Hochner, director of Hadassah Mount Scopus Hospital's OBGYN department, surprised leftist and Arab MKs who took part in a stormy Knesset session Wednesday morning regarding the separation of Jewish and Arab women in maternity wards. "There are Arab women who after birth ask not to be with Jewish women, they ask bluntly and point-blank," exposed Hochner. She further revealed that there are Arab women who are afraid of being in the same room with a Jewish women and say to doctors: "maybe she'll kill me in the night." "We are living in a problematic political reality and medical professionals give completely equal treatment to Jews and Arabs. When it isn't medical treatment - as in the maternity wards - we do our best to meet all requests," added Hochner. The revelation is particularly significant in light of the media uproar since last week, when MK Betzalel Smotrich (Jewish Home) said separate rooms should be an option while noting on noisy Arab post-birth parties. After his wife was recorded saying she had asked not to be with Arab women, Smotrich said many Jewish women including his own wife "wouldn’t want to lie down (in a bed) next to a woman who just gave birth to a baby who might want to murder her baby twenty years from now." In response, his party chairperson Education Minister Naftali Bennett condemned him and rejected the idea of "hating Arabs." In the Knesset session on Wednesday, Hochner exposed how racism charges over the matter are baseless by providing another example of how new mothers are allowed to request separation. "We do a separation between haredi women and secular women on weekends. They always ask that haredi women be with haredi women so that they won't talk on the phone on Shabbat," she said. "You can't call that discrimination. Of course we won't let an Arab mother lie in the hallway if there's only one bed left in a room with a Jewish woman." MKs Yael German (Yesh Atid) and Aida Touma-Sliman (Joint List) attempted to interrupt Hochner from speaking, cutting across her words and charging her with discrimination. In response, Hochner said, "we don't ask every mother where she wants to be, but of course we are considerate of all of them." "A separation of haredi women and secular women is racism? It's discrimination?," she posed, noting how the accusations simply do not fit. As the topic of separate maternity wards gains attention, a poll on Monday revealed that 69% of the Israeli public would prefer separate rooms for Jewish and Arab women.